September 1, 2000, East Brunswick, New Jersey. 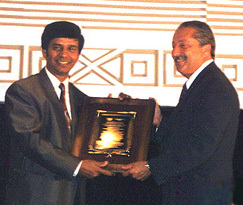 In their biennial convention National Federation of Indian American Associations attended by over two thousand people, Manick Sorcar received a standing ovation and was honored with an Award Plaque for "Excellence In Arts". He was an invited guest and performer at the convention of three days at the Hilton Towers, where in addition to the convention, entertainment programs were held. Manick Sorcar showed his latest laser magic "Dancing With My Soul" through 'Sorcarscope', (a registered trade mark) for the new technology he has developed in combining live action with on-stage laser animation. His other laser animation classic "India Forever" of eight minutes, which displayed the milestones of India's 4500 years of history received thundering applause from the audience awed with the cutting-edge laser technology mixed with Sorcar-art. Sorcar received the award from Congressman Sam Gejdenson (D- CT, 2nd District), Congress of the United States, Committee on International Relations, House of Representatives, Washington, DC, USA. Other dignitaries included Steven R. Rothman, Member of Congress, Shashi U. Tripathi, Consul General of India, H.R. Shah, Chairman of TV Asia, Srichand P. Hinduja, Chairman of Hinduja Group of Companies and many more. Renowned singers from India such as Sudesh Bhosle, Alka Yagnik and Bela delighted the audience with their melodious voice through Indian songs.